As I mentioned a couple of weeks ago I've been putting the finishing touches on the latest version of my internet safety book: The Ask Leo! Guide to Staying Safe on the Internet - Expanded Edition. I'm very pleased to announce its release. If you purchased the previous version: make sure you've registered your book using the link in the book, and you'll find the new version ready for download on your registered owners page. That's what "Digital Updates For Life" is all about. If you downloaded the FREE version: this is a different, expanded version, slightly over twice the size, available for sale in The Ask Leo! Store. For a limited time The Ask Leo! 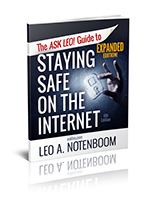 Guide to Staying Safe on the Internet - Expanded Edition is on sale for 25% off. and you can use your newsletter subscriber bonus coupon code (near the bottom of every emailed newsletter), for an additional 20% off. 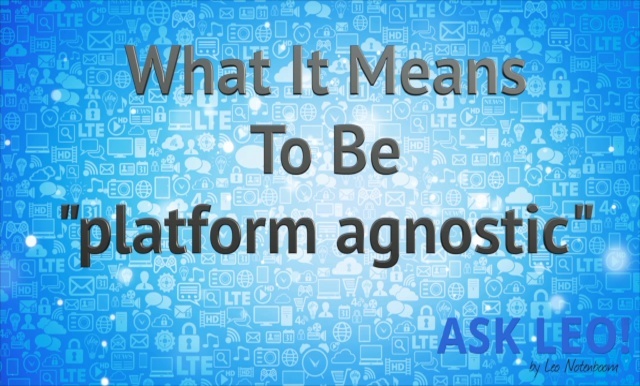 I describe myself as being "platform agnostic". I think that's a pretty useful thing to be. I discuss what that means, and why many passionate proponents and opponents of various platforms make me sad. Continue Reading: What It Means to be "Platform Agnostic"
As I've said before, one way privacy issues happen is through people's own actions. Over-sharing on social media is the most common example. Nowhere is that more common than on Facebook, where privacy settings are so complex it's often difficult to know exactly who can see what, when, and where. Let's review Facebook's privacy settings, and perhaps most importantly, what they might imply. How can I prevent this new risk of criminals encrypting files on my hard drive and then demanding a ransom to unlock the data? Is having a router and software firewall enough? In other words, how do you avoid ransomware? Let's look at ransomware – software that holds your computer hostage until you pay up – and how best to protect yourself. Spoiler alert: you already know the answer. Unlike search engines such as Google or Bing, Ask Leo! is a real person: me, Leo Notenboom. That means when I get a question (and I get lots of questions), there are various steps I take to come up with the answers I post here. Did I mention I get lots of questions? Unfortunately, that means I can't answer every single one. However, I can outline some of the resources I use when I need them. Continue Reading: Where Do You Get Your Answers? EaseUS boot menu option reliable? Typically, ransomware encrypts a significant portion of the computer's hard drive so it's no longer accessible to the user. The encryption is often a strong public key encryption that is practically impossible to defeat. Once the ransom is paid, the person or people behind the malware may offer a method to decrypt the data and restore access… or not, simply taking the money. It's important to realize that ransomware is simply another form of malware, and is often delivered in the form of a virus or trojan. As such, it's best avoided by all of the same techniques that one uses to avoid any malware: up-to-date and properly configured security software and settings, keeping your system up-to-date, and using safe online behavior. I'm too old to understand all of this. Will I have to pay someone to do it for me. You've given up before you've even started. Very sad every time I see this. You're never too old! Product, service, and cause are three types of efforts I've characterized as needing web sites. I'll elaborate on what those mean. Read: Product, Service, or Cause?